^ This effect could, of course, be presented as a demonstration of clairvoyance. My presentation is slightly different. It's based on conveying a Zen-type union between the "warrior" and his "weapon," I don't mean real Zen, a subject I neither know nor care anything about. I mean the popular notion of Zen as reflected in martial arts movies and David Carradine TV shows—in other words, the entertaining kind of Zen. In phases one and two, the spectator's card will sometimes be near the bottom of the deck. Rather than have the spectator count through virtually the entire deck, I handle it this way. Ribbonspread the deck on the table. Point out that the bottom card is the fifty-second card from the top. Then count backwards from the bottom of the spread, touching each card as you count it. When you reach the previously announced number, push the card partway out of the spread. Gather the cards below it and drop them at the top end of the spread. Gather the deck, except for the outjogged card, and place it aside. After revealing the card, you have only to drop it on top of the deck and the cards are all in sequence. I do this only with very high numbers. (Forty-two is my cutoff point,) Otherwise, I think its more effective to have the spectator deal irom the top. In phase three, I have the spectator count from the top regardless of the number. Otherwise, you lose the dramatic impact of having the face-up card appear on the predicted number. Until you've tried this, you may fear that you'll have trouble holding the audience's attention during the repeated cutting of the deck. As I mentioned at the outset, however, this is something to do alter you've hooked the audience with other strong effects so you no longer have to fight for their attention. Furthermore, you'll find that the extended cutting will itself hold people's attention simply because they'll be wondering what the hell is going on. (In Strong Magic I termed this mystery-curiosity suspense). In fact, if you handle it right, you can generate a fair amount of amusement Irom your requests for more and more cutting. After the first phase, the spectators will be so astonished you won't have any trouble holding them. In the first case the cards are dealt face up and in the second case they're handed to me. 1 like to have them dealt face up the first time to let the audience see the 'random" order. That having been established, I preier to eliminate the distraction of face-up cards the second time. If, however, this minor inconsistency of procedure bothers you, you can use the same approach both times. The reverse count in the last phase destroys the memorized stack. 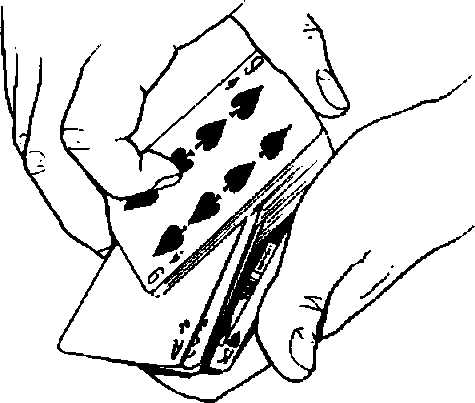 If you want to preserve the setup you can use the approach of having the spectator hand you the cards as she counts. (I don't think having the spectator deal face up is a good idea this time as it presents a confusing picture when she reaches the face-up selected card.) I don't bother because I almost never perform another effect after The. Zen Master.